As businesses grow, they need to have the ability to quickly scale up their communications systems. They need communications systems that are highly configurable, flexible and virtualized in order to meet the expectations of today’s real-time consumer. This is impossible to accomplish using conventional on-premise or pure cloud-based telephony systems due to the higher setup costs, the poor quality of service, maintenance costs and the dependency upon IT support. 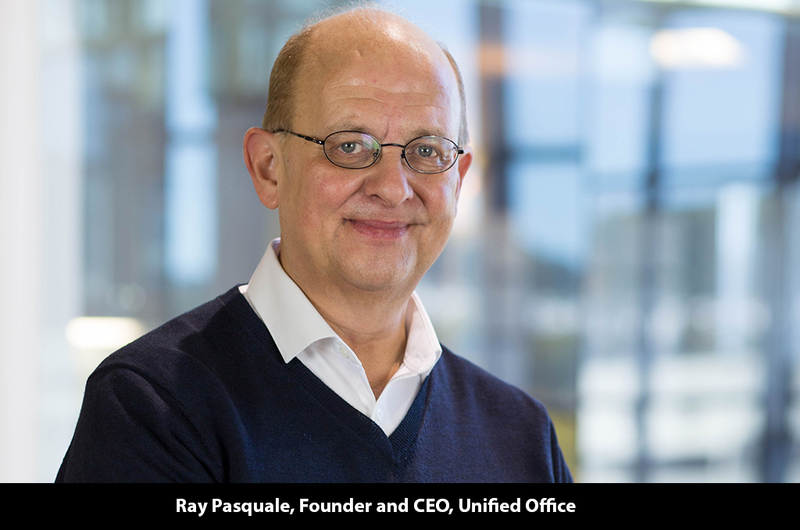 Ray Pasquale, Founder and CEO of Unified Office created Unified Office to address these challenges. Ray comes from a background of building big switches for the largest telecom operators, the Verizons and the AT&Ts of the world. As a senior executive at Sonus, Cascade and AT&T, he helped build voice over IP switches that had to withstand earthquakes, for example. VoIP offerings in general have earned a bad reputation due to dropped and clipped calls and overall poor quality and reliability. The Internet was not built for the delivery of real-time applications. Ray set out to make VoIP work over the Internet for businesses and to give them the value-added tools and services to monetize voice that in turn would improve their top and bottom-line performance. He saw an increasingly impatient real-time cultural behavioral shift in the global economy thanks to the likes of Amazon and the Internet in general and wanted to design a suite of solutions to help businesses of all types adapt and prosper in this new economy. Founded in 2011, Unified Office is recognized as a leading provider of SDN-based, hybrid cloud managed VoIP and Unified Communications services to small and medium-sized businesses (SMBs). Unified Office recaptures lost revenues for their customers. Some have immediately seen an increase of as much as 35% in revenues. Domino’s Pizza, for example, a very large customer of Unified Office receives nearly half of their revenues over the phone. If callers get busy signals particularly during peak periods, today’s impatient consumer may call someone else and that can result in significant lost revenue opportunities. Unified Office’s flagship product is their Total Connect Now service, an easy to use managed business communications service that integrates voice and video communications, messaging, service-level monitoring, business continuity, and business analytics tools into one seamless, high quality, reliable communications service that can be configured to meet the unique needs of any business. Their Highest Quality Routing Protocol is their patented over the top transmission network platform on which all of their services are based. Unified Office has built their platform on top of an open-source system, so it is highly scalable, customizable and never obsolete. Unified office enables customers to answer an unlimited number of inbound calls. Visual Performance Suite, a suite of analytics tools that provides a real-time view of changes in operational performance levels and actionable intelligence on a big screen TV, enabling managers to determine business performance and take immediate actions to apply continuous operational improvements. TCNOPS 2.0, an Internet of Things (IoT)-based infrastructure management and operational performance service, not only monitors and analyzes IoT data but adds the ability to automatically or dynamically control thermostats and other components such as air conditioners, refrigeration equipment, make tables, stove exhaust vents, heaters, security and video systems, safe doors and other devices. Virtual Communications Console, an operator console that integrates with leading vertical market software solutions for dental practices, hotels, and other businesses, enabling an admin in any office or at home to transfer calls from a tablet to the right person wherever they may be, and retaining patient information with each call transfer. Operations Management Suite customer portal that enables customers to manage and configure their services. Unified Office delivers TCN as a managed service, watching over their customers’ networks 24/7. TCN comes with a fully integrated LTE failover if there is a broadband outage or other type of quality problem. The company knows if there are any issues before their customers do and 90% of the time, they have them fixed before they realize there was an issue. Most other VoIP companies offer no visibility into customers’ broadband connections. Unified Office has done all of this without having to resort to expensive, legacy technologies like T1 access lines. The culture of the company is very customer-focused. Unified Office is always innovating new things that will benefit their customers. They will never build a technology just because they can do it. Just like Steve Jobs built a better MP3 player and then a smartphone, they are building value-added business communications services. They listen to their customers and help them solve their pragmatic business problems so they can improve top and bottom-line performance. Unified Office will soon roll out a sentiment analysis offering, which uses AI and machine learning to enable customers, such as restaurants with thousands of recorded calls stored up, to quickly go through those calls and detect if a customer was angry or happy. It also enables them to search for certain keywords, saving them untold amounts of time in the process. In the future Unified Office plans to expand their IoT offerings and advance further into a number of vertical markets such as general medical practice management and the hotel industry. Expansion overseas is also on the roadmap.